We support communities to achieve their long-term visions for development. Our Community Transformation Process is community-led, tailored to industry and county context. It combines traditional wisdom with innovative technology, for a truly sustainable model to development. We apply tools and methodologies that are practical and proven approaches garnered from the Canadian Indigenous experience over the past 40 years, particularly in navigating opportunities and obstacles around natural resource management on traditional lands, building successful Economic Development Corporations, founded in a vision and good governance, and strong partnerships with the public and private sectors. The models of success we look to include: Tahltan Nation Development Corporation, Tlicho Investment Corporation, Des Nedhe Corporation and the Mississaugas of the New Credit. 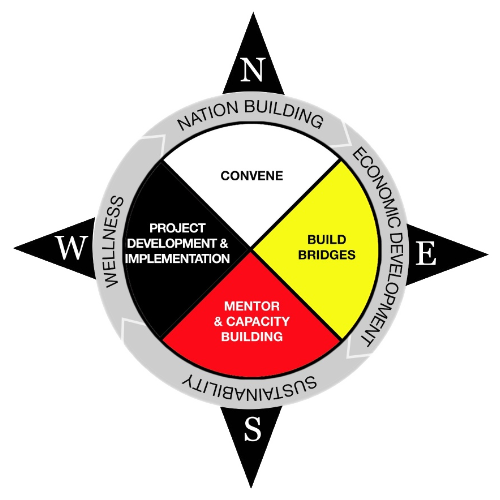 As the traditional medicine wheel represents the interconnectivity of all things, the four directions, and the inclusivity of all human races (white, yellow, red and black), our approach is a continuous process employed to empower Indigenous Peoples achieve harmony and prosperity through self-guided economic development. Through this approach, we support Indigenous communities in Nation Building, which includes Economic Development, Sustainability (environmental and cultural) and Wellness (spiritual, physical, mental and emotional). This methodology, utilized within a framework of inclusivity of Indigenous Peoples, governments and commercial enterprises, supports strong, vibrant and resilient communities, organizations and Nations, with empowered and confident people, and prosperous partnerships. We convene by bringing together Indigenous communities and facilitating dialogue and communication to understand the unique self-defined vision, goals and priorities of the group. We Build Bridges between Indigenous communities and organizations in the public and private sectors, assisting them to set joint objectives, align visions and become joint decision-makers in development. Areas include natural resource management, infrastructure creation, environmental and cultural preservation, agriculture, food systems, and tourism. We also advise private enterprise and governments who are aligned with our objective of Indigenous economic empowerment to effectively participate in equitable partnerships for mutually beneficial sustainable economic development. We mentor and build capacity. At Indigenous Trust, we believe that the process is as important as the product. Using our Community Transformation Process, along with workshops, seminars and knowledge exchanges we create a holistic community-led practice that reflects the interconnectedness of the community and enables members to define their future on their own terms. Communities are empowered to complete the process themselves, with the support and mentorship of our Aboriginal Architects of Change, (link to “Who we are” sub section) ensuring that change is actually felt on the ground. We implement. Indigenous Trust supports indigenous communities implement their long-term visions with development planning, good governance structuring and capacity building, partnership facilitation and development, skills training and implementation of projects in the following sectors: agriculture, eco/spiritual tourism, mining, energy, and infrastructure. All projects are selected based on financial sustainability, such that investors and partners can receive a ROI in the medium term, and the communities can become financially independent in the long-term. We provide services directly to indigenous communities. We also support companies, supply chain partners, governments and organizations who are aligned with our objectives of Indigenous economic empowerment, to effectively participate in sustainable partnerships with Indigenous communities. Community Policies: natural resource development policy, environmental protection, heritage enrichment policy, business protocol policy. Career Apprenticeship for Job Advancement.